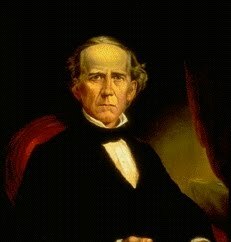 Joseph Albert Wright was the tenth Governor of the U.S. state of Indiana from December 5, 1849 to January 12, 1857, most noted for his opposition to banking. His positions created a rift between him and the Indiana General Assembly who overrode all of his anti-banking vetoes. He responded by launching legal challenges to the acts, but was ruled against by the Indiana Supreme Court. The state's second constitutional convention was held during 1850-1851 in which the current Constitution of Indiana was drafted. He was a supporter of the new constitution and gave speeches around the state urging its adoption. He was opposed throughout his term by Senator Jesse D. Bright, the leader of the state Democratic Party. After his term as governor, he was appointed to serve as United States Envoy Extraordinary and Minister Plenipotentiary to Prussia where he served until the outbreak of the American Civil War. Although he was a Democrat, he was openly pro-Union during the war, and was elected to serve as a United States Senator, filling the term of Copperhead Jesse D. Bright, who was expelled from the Senate for disloyalty.